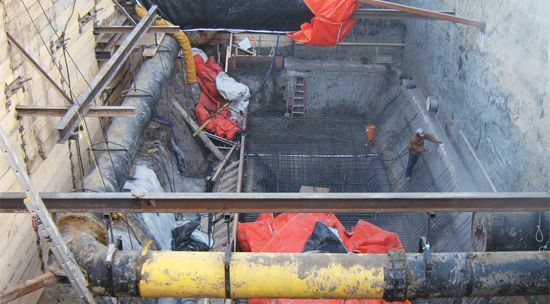 This excavation shoring project was HCM Contractor’s first project in the Saskatchewan construction market and facilitated the expansion of the working water treatment plant in Prince Albert, Saskatchewan. Wall design required tieback anchors and the equipment required to install the tiebacks could not easily fit into the excavation. 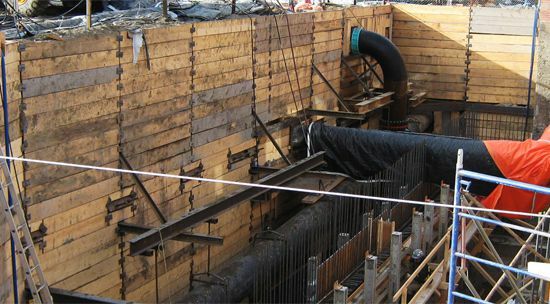 To solve this problem, HCM used an excavator- mounted TEI drill to reach down from the top of the shoring wall and install the anchors. Also, extremely cold temperatures in Prince Albert, often dipping to around -40C., presented problems for grouting. 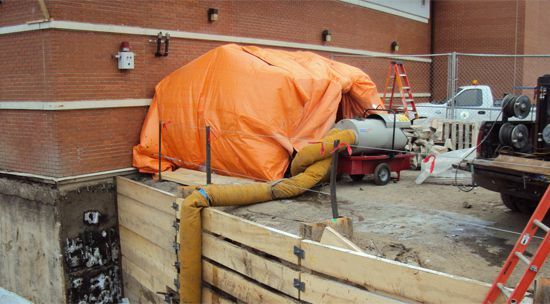 To keep the grout plant and lines from freezing, HCM came up with an innovative solution that included fabricating a heated structure and water boiler for the Oberman grout plant, overcoming the problems with grout mixing in the cold temperatures. A diesel heater heated the structure and the grout lines ran through heated ducting. This allowed grouting to continue during the cold snap. HCM also provided extensive welding and fabrication for this project. Pipes from the existing water treatment plant ran through the site and had to be supported. This required the fabrication, both on-site and in-house at our shop in Calgary, of a large number of pipe hangers and walers.